A LaVista couple made that call a while back, and they’re brave enough to let me share their story here. The house in question sits in a neighborhood full of homes built 10 to 20 years ago (that’s not vintage, folks) and filled with golden oak wood. Trim. Cabinets. Doors. Flooring. Staircase. Everywhere. After living there for a while, the couple, who share the space with two kids in high school, said enough is enough. They were ready to do what it took to love where they live instead of dreading it every time they come home and turn on the lights. This island had to go. They also asked me to come up with a solution to their bat wing island (no offense to bats), which left half the kitchen useless and the other half busy when someone was washing dishes. I loved the fact that the Golds (that’s what I call them) understood the value of their home and didn’t want to “over improve” it. They simply wanted their investment to be worth it at the end of the project. I couldn’t agree more! 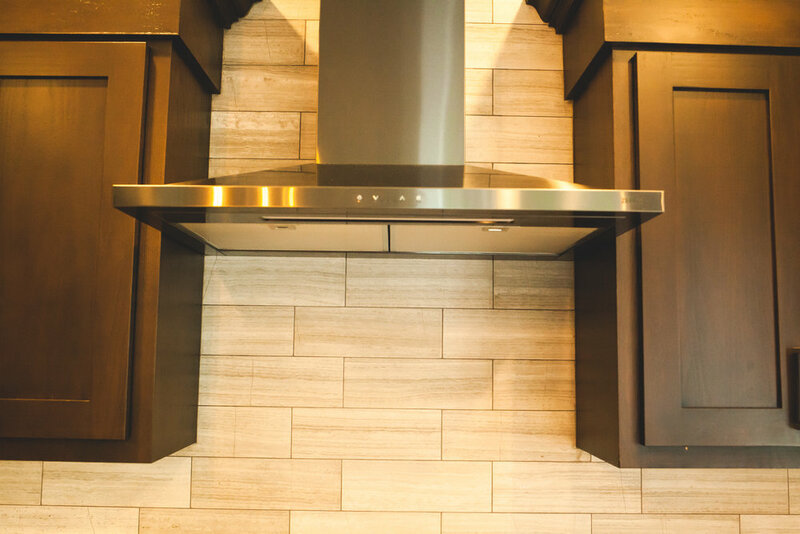 One of my biggest design challenges was the kitchen cabinets. There wasn’t enough in the budget to buy new ones, so we modified some of the existing ones with new paint and doors. 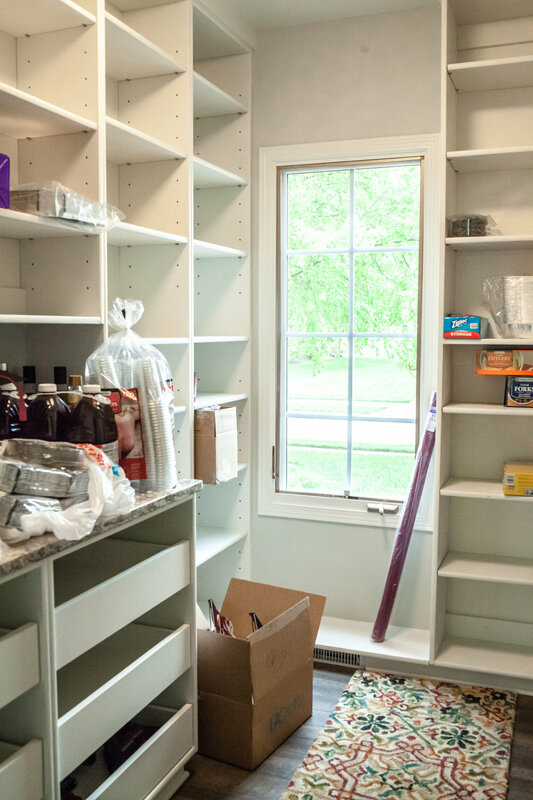 We also added new cabinetry that functions as overall storage, which they totally needed. The unused dining room was converted into two functional spaces. Another concern: they didn’t have a walk-in pantry. We decided to re-purpose the dining room – which they never used – by splitting it in two. Half is now a huge walk-in pantry, and the other half is a foyer/seating area with a coat room on the other side. 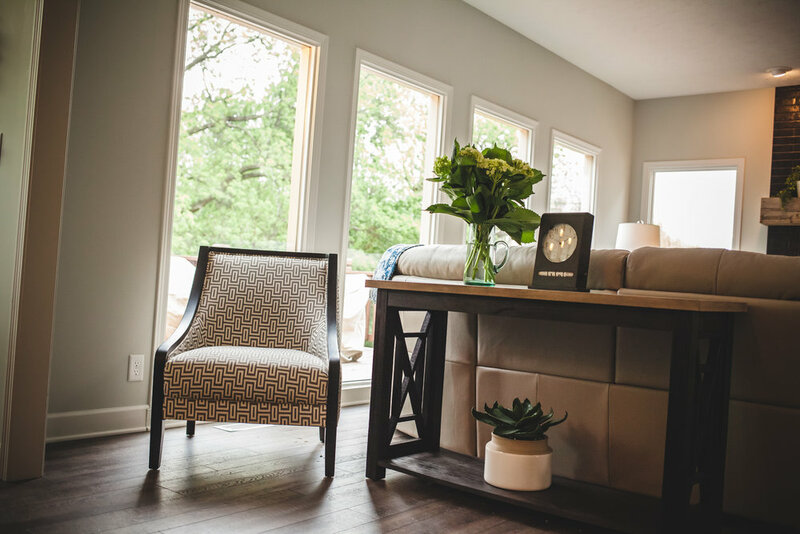 Since the dining room windows were separated in the center, we were able to add the new wall without making any changes to the home’s exterior, thus keeping the expense low. Sometimes I amaze even myself at what we come up with! 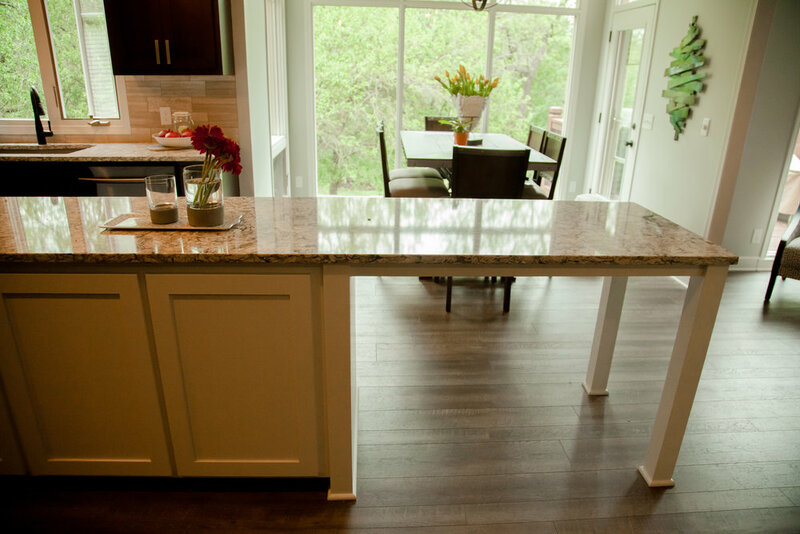 This change allowed us to double the size of the kitchen island and add four new seats. 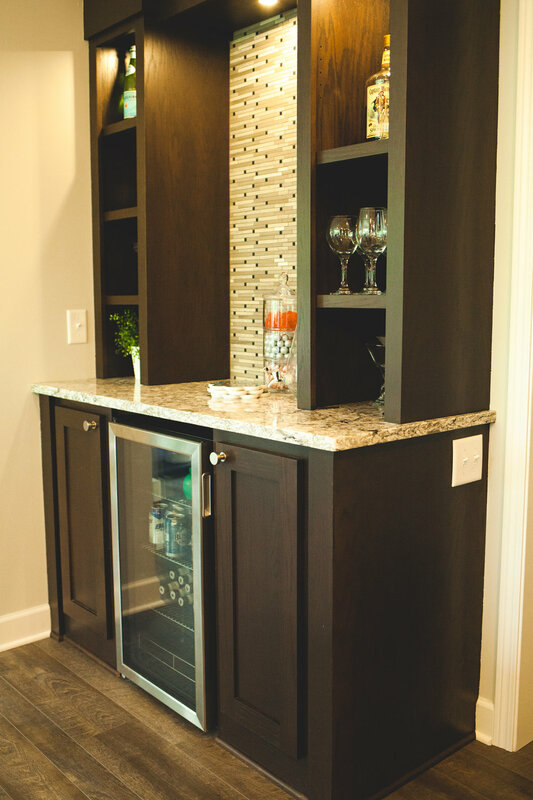 We also removed an old desk and added a dry bar/beverage center to give the kids and their friends easy access to drinks (non-alcoholic, of course), even if their parents are cooking. At the end of each project, I always look back and have a favorite part. With the Gold’s home, it’s the completely different emotional response you get when you think about what it was like and what it is now. 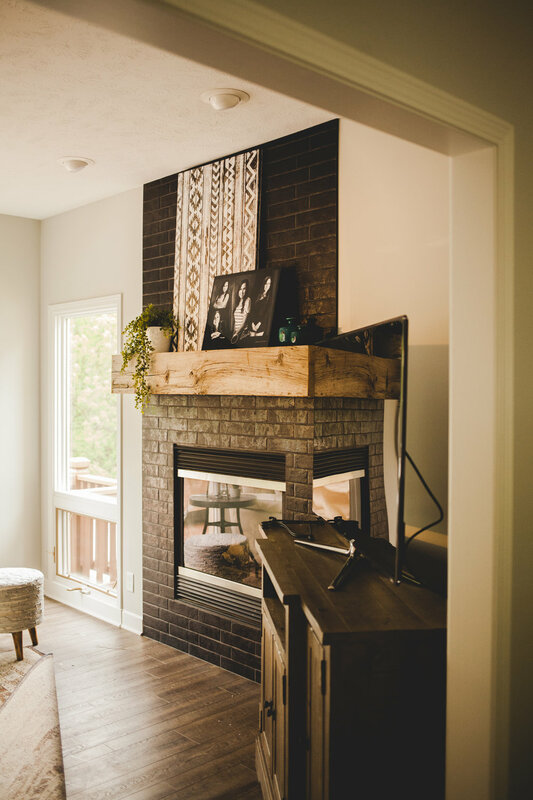 We created a brand new house on a completely doable budget!